Hello once again! I've been back at University for just over a week now and am still getting into the swing of things (hence the sporadic posting). My room is so close to being all sorted out, apart from the odd bits (WHY do I have so much stuff? - but all essential stuff of course mum & dad!). I have enough teacups and saucers for a street party and I don't know why! I'm Charlie Murray and i'm a hoarder, there I said it. Anyway, other than trying to spend the past week unpacking (and clearly failing) I've been having a lovely time settling into my new house, which is pretty darn special, and having fun with my amazing housemates. I'm just about to start my second week of 3rd Year, and the work is already piling up, i've got so much reading to do that I reckon i'll soon be known as a hermit and start talking to myself to stay sane (not that I don't talk to myself already!). Today was our University's Freshers Fayre, and being the co-President of the Tea Society I worked on the stall trying to recruit new members, plying them with sweets, biscuits and of course, tea. It was fun, but who knew talking/standing for nearly 6 hours was so much work, especially when I can just about string a sentence together when talking to strangers. 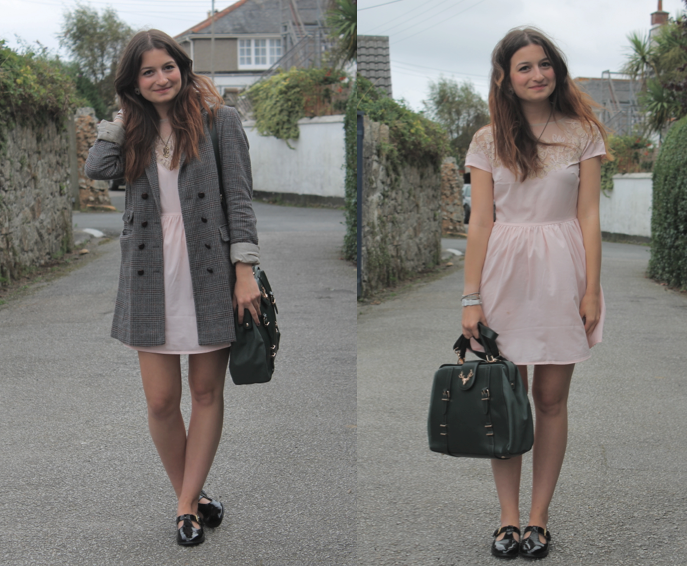 I chose this dress as I needed to look relatively girly and tea-lady-ish (real word! ), even if it is extremely see-through and very blowy (cue me walking around in the Cornish wind desperately trying to protect my modesty, ha!). I very nearly ruined the dress too, first spilling tea and then squidging bourbon all over me, i'm classy. 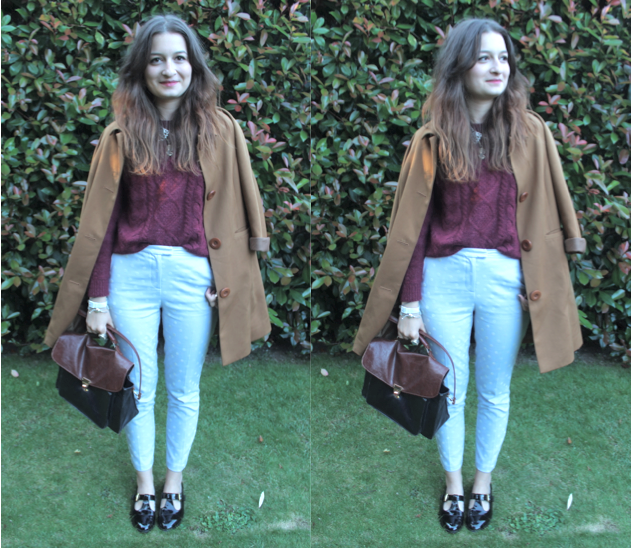 I tried to make the outfit a bit more autumnal with my favourite tweed coat, and my new bag from Accessorize. I've been needing a new Uni bag for a while as the lock on mine no longer works and is pretty dangerous when filled with my books and laptop. How cute is the little gold Stag against the greeny-khaki colour, i'm in love! Sad I know, but yes, i'm smitten. Enough of my rambling, i'm off to watch last nights episode of Doctor Who, and i'll be accompanied with plenty of tissues and tea after seeing a not-so-secret spoiler on the Daily Mail. Have you all had a lovely weekend, did you watch the Doctor too (I hope it's not as bad as i've heard!)? Oh, I need some help too, the Cosmo Blog Awards are coming up this week, what do I wear?! Help please!! Hello! I'm finally back doing my outfit posts, and it's with my new favourite pair of shoes. I had these shoes on my Topshop wishlist the other month in burgundy, but ended up buying them in black as I thought i'd get much more wear out of them as they go with practically everything. If you follow me on instagram you'd probably have noticed by now that they haven't really left my feet! I'm so happy that the weather is finally cooling down, with crisper and chillier mornings and evenings calling for a jumper and jacket. Autumn is by far my favourite season. Definitely. I've been in a bit of a rut with my clothes at the moment, feeling like I keep wearing the same things over again, and not being able envisage different combinations, but I tried to make these 'summery' trousers a bit more autumn-appropriate with a burgundy knit and back-to-school shoes. How do you keep yourself inspired, particularly with fashion and the changing in seasons? I don't think the black shoes *really* go, but oh well, they're comfy and cute! I'm back to University on Thursday, and as soon as i'm all settled in i'm planning on putting a couple of bits up for sale on eBay. I'll put some of the best bits on my blog too, so keeps your eyes peeled! I'm just about to start my third and final year at Uni, and am already dreading the amount of work that has to be done, with my dissertation on top of module work and trying to fit in enjoying my final year as much as possible. Are there any graduates out there that could offer me a bit of advice on how to stay on top of the workload whilst still keeping sane, or is there really no hope?! I have a post coming up for any Fresher's on how to survive the severe change in lifestyle, hopefully it'll be up this week. Ooh, I'm now part of the Motel Rocks street-team, so if you've got your eye on something, you can get 20% off with the code 'charlestown92'! Pretty good, eh? P.S. Is anyone as hooked on the Great British Bake Off as we are in the Murray household?! It's one of the best things about the start of autumn, especially with Mary Berry. Oh, and a little bit of drama tonight with John tonight, had a little panic when I thought he was out due to his injury as he is my favourite by far! 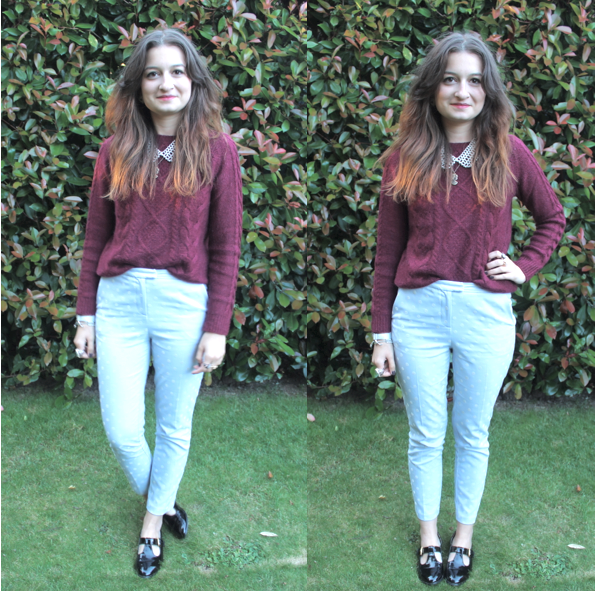 P.P.S Apologies for my weird facial expressions, I really don't look like me in the first picture, odd. This little blog has been on hold recently, life seems to have taken over a bit! But to be honest, I really haven't had that much to blog about. I got back from Paris late Monday evening, and since haven't been up to too much. Paris was definitely one of the best holidays that i've ever had. I loved the city so much (sorry NY, but you nothing like Paris! ), the architecture, the culture, the sights. We were really lucky with the weather, with beautiful blue skies and hot, sunny weather each day. We had 5 days in the city, and so we had enough time to visit all of the major sites/buildings that we wanted, and it also meant that we could have some time to laze about in the parks after a long day of walking (I don't think i've ever walked so much). Thank God for their Metro's! We rented an apartment from airbnb, which I think was the best decision we made (hope you agree Alessio! ), it was so much more relaxed than staying in a hotel, much more cosy and comfortable. Being in a typically Parisian building, it really felt like we were living like proper Parisians, even with a little balcony looking over a courtyard. If I ever venture to Europe again, i'll definitely take a look on airbnb, a lot more affordable than a hotel too! I would really recommend having a peek at their website if you're going away and unsure of where to stay. They also have a lot of apartments available in England, and even further afield in America. Now, back to the beautiful city that is Paris. Everything about Paris I loved. The breakfasts were definitely my cup of tea, what more could you want than brioche or a croissant with jam, French butter (which seems to taste way better than ours) and a bowl of sweet hot chocolate?! I really, really loved the city, because of it's history, beautiful architecture, the symmetry. It almost felt like I was walking through a dream world when walking down the cobbled streets and past the rows of balconies filled with flowers. I could definitely see myself living in Paris, (only have to learn French first, ha!). Sorry this is a bit of a short post, these are just some of my pictures from Paris, I have so many on my laptop (way too many to show). I'll have to do some more picture posts from the holiday, especially of our day in Versailles which was always destined to be pretty special as we sat on the double decker train (crazy, right?! ), although I don't think i've ever seen a historical site so busy, at many points our view was blocked by a sea of arms throwing their cameras into the air in the hope of getting a picture. I'll post more about where we visited soon! For some reason i've felt a little bit stressed today. I've got my first ever London fashion Week event tonight and am feeling very worried about what i'm wearing, whether it's too casual, not casual enough, if i'll look silly in a crowd of fashionable and important people, tripping over in front of everyone with my cocktail etc. But i'm sure (fingers crossed) it'll all be fine, I'm feeling the excitement! I start my third year at University next week, and so my venture back down to Falmouth is imminent. I can't believe the summer is over already, and I really don't feel quite ready to go back to University yet! If you're starting your first year, hope you're enjoying the fresher's events so far, i've got a post with some tips/advice coming up! Right, off to get some writing done, hair tamed and nails painted. And I promise i'll get back into my blogging this week, eek. Giveaway: Tickets to LFW's First Vintage Fashion Show! Hello! This if my first giveaway in such a long time, nearly a year, but here it is and it's pretty darn special. Anne from Kapranos PR very kindly gave me two tickets for a giveaway to LFW's first Vintage Fashion Show, Retrospective. Retrospective explores fashion from the past to predict upcoming trends, and has teamed up with some of the best vintage experts in London to create a catwalk show exhibiting one-off vintage pieces from some of the worlds finest design houses and famous names, such as Mary Quant, Ossie Clark and Chanel & Dior from the 1920's. After the catwalk show, the party will move to the dance floor with an event celebrating some of the finest aspects of fashion in the last century, which you can enjoy whilst sipping cocktails from Bourne & Hollingsworth! Retrospective takes place on the 15th September 2012 at Bloomsbury Ballroom, and is set to be a LFW party like no other! * Leave me a comment stating the favourite piece of vintage clothing you've managed to get your hands on! * For an extra entry, you can tweet about this giveaway! The giveaway closes on the 12th September, good luck! Me and my little sister Isobel visited Knole Park yesterday, just for a couple of hours, as the house and private garden were closed, but luckily the park and tearoom were still open so we had some lunch followed by a little walk surrounding the house. I've visited Knole a fair few times before as not only is it pretty close to where I live, but I think there's something special about it; the house is one of the largest, and most complete sites owned by the National Trust and has been home to some very important literary figures; Vita Sackville-West and Virginia Woolf, making the site's upkeep and restoration highly important. If you aren't too interested in history, or if the house is closed, the park itself is beautiful alone; it hasn't faced any dramatic changes throughout it's 400 year existence and still houses herds of deer (many of which aren't too scared of humans so you can get pretty close!). The tearoom is also pretty special, being in Knole's old brewhouse, I always think that National Trust is delicious too (especially their ice-cream and cakes!). As I only have one more year left in Cornwall, and there's so many National Trust sites dotted just outside of Falmouth, i'm really tempted to buy a student year membership as it would save me so much money. Do any of you have one, and would recommend it? Historical Fact: The Beatles filmed two of their music videos in the grounds of the house, for 'Penny Lane' and 'Strawberry Fields Forever' in January 1967. If you visit Knole, you might be able to recognise the archway in which the four Beatles rode under! National trust are currently working to restore Knole House to it's former glory to ensure that it's historical future is safeguarded, with a £2.7m project. The work will include fixing many major problems within the house that need urgent attention, and transforming new rooms to be opened for the public. If you are interested in finding out more, volunteering for the restoration project, or even donating, you can find out on their website here. On another note, thank you so much if you voted for me in the Cosmo Blog Awards, the party is coming up and I can't wait. I don't expect to win, I'm just amazed that I was even shortlisted, especially with some of the blogs in the line-up too, some of them have become some of my favourite reads. I'm off to Paris tomorrow early tomorrow morning with Alessio, and should be back Monday, so the blog will be a little quiet till then, but i'll still probably be posting on the ol' instragram! I'm charlestown92 on there if you fancy taking a peek. Hope you've all had a lovely summer, I can't believe that it's officially over. P.S. I have a very exciting giveaway coming up on the blog this week, so keep your eyes peeled!